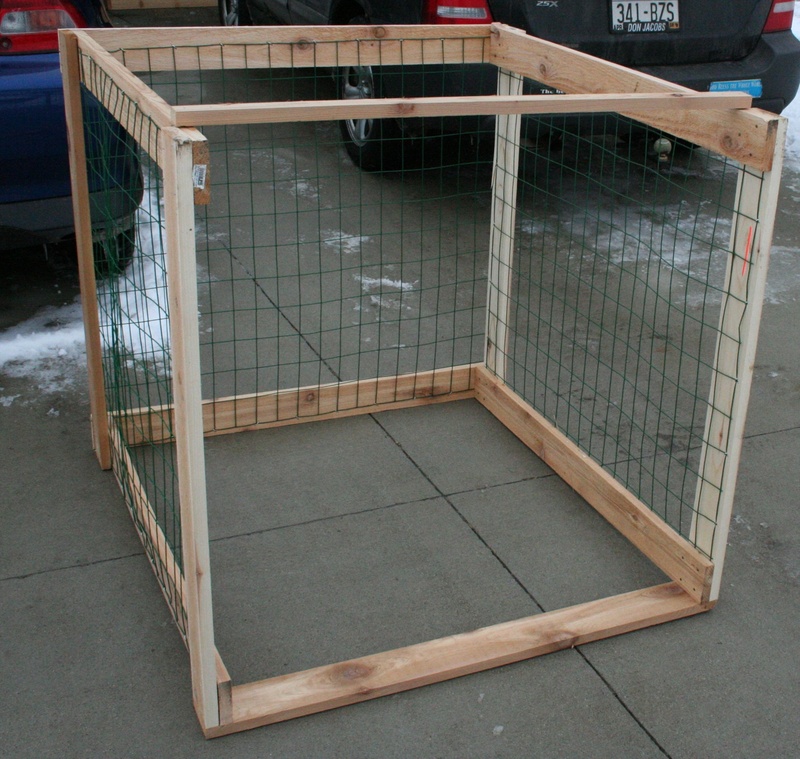 I posted recently about an idea for providing low cost garden systems that came to me while blog surfing. There is so much buzz about Michael Pollan’s new book, and at the same time so many of the Garden Blog set have Spring Fever and are challenging each other to various great ways to expand their gardens. But what if you read Pollan’s books, get all fired up about eating fresh food, but have zero experience with gardening and no garden blogger friends? 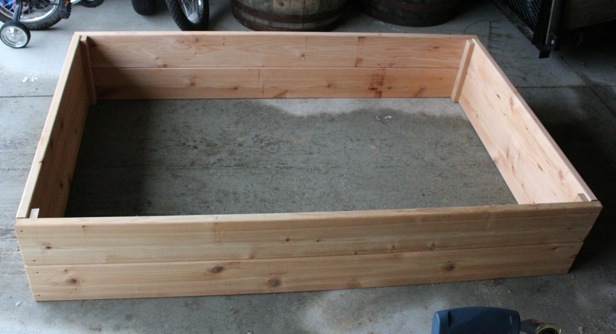 I had proposed building a small raised bed of cedar, and then coupling it with a small 1 cu yard compost bin, and a rain barrel. Combining the three would allow a household to grow local food (at least some salads), begin learning about waste recycling, and also water storage and harvesting. Below is my first crack at the prototypes this weekend. All told, well under $100 in materials (and that is including enough fencing to make 4 bins) and about 3 hours for this armchair handy man if I had built the rain barrel. 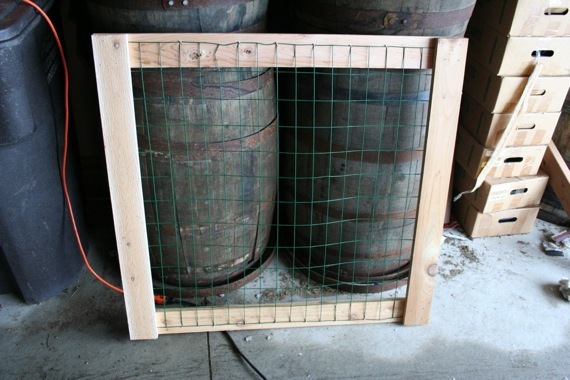 The product I will present for our county’s sustainability group will not use the oak whiskey barrel due to pricing, but I included it for now since I have not yet received delivery of the plastic 55 gallon drums. The pitch that I will be making to the group this week, is that with some grant work or sponsors we will be able to provide these systems to the community for $75 or so… installed. With Plants! In our own family, we started down the road to a more sustainable lifestyle due in large part to our desire to find healthier food for our kids, and just look where it has led! Everyone eats, and even on taste alone the difference in home grown heirloom food is evident to virtually anyone. Food is a great “in” with fence sitters, but its not the only one. Composting can seem like magic to those not familiar with natural systems “you mean garbage can turn into dirt?”. And in conversations I had selling over a hundred of rain barrels last year convinced me that they have a great ability to start conversations about recycling, wastefulness, and common sense practicality. Why not put all three into a turnkey system and start turning the some small portion of the wastes of suburbia to good use? Though I spent some energy paring down the designs to inexpensive form, there are cheaper ways to do this, and certainly more environmentally friendly ones using reused materials, etc. But I am choosing to break some eggs to get an “in” with those just starting to look for ways to lower their impact. I am banking that an attractive, long lasting cedar system will allow us to reach a larger audience -to make a bigger impact. Once this country grew local veggies to help a War Effort. I believe that now the time is right to grow veggies in a sustainable fashion, across the nation, to show the world that American can unite for something besides destruction. The end goal hasn’t changed: we are still fighting for the future of our children. But this time, the stakes are, if anything, higher. Below I will give a high level “How To” to help you make one for yourself, or if in case you want to start a program in your area. Keep in mind that I studied philosophy not architecture or engineering and absolutely zero CAD design software was harmed in the making of these products. Handful of 4d coated nails. Cut the Cedar Decking boards into 5′ and 3′ pieces and then cut the 1″x2″ into 4, 11″ chunks. 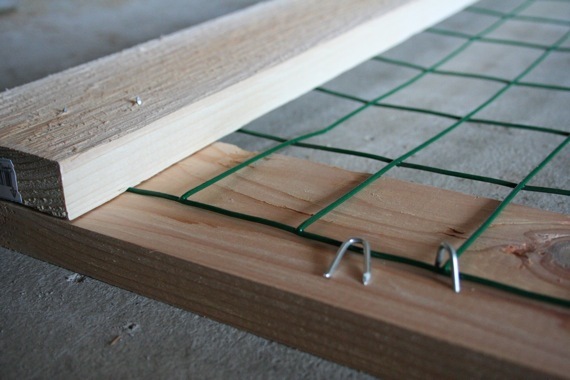 Use the 1×2 pieces as corner braces to support and nail the decking together. Done! 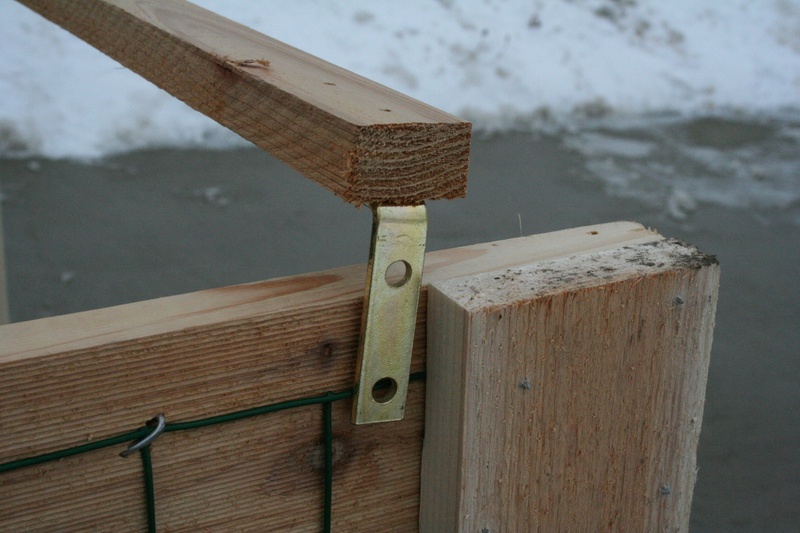 The brace is sized to fit behind the front uprights which will prevent it from slipping off the front of the bin. Congrats! Your done! Of late I am on a mission to reconnect (sub)urban Wisconsin to get back to their roots. Literally. I want more people growing more of their food. My Sub Acre Ag project is grand -designed to permit a family of 4 to meet most of their vegetable needs for most of a year with good canning, or to trade/sell/donate the surplus at local markets or with neighbors. But its scale and complexity will most likely turn some people off, so I am also looking for a “Starter Garden” to encourage people to grow some food in their backyards… even if it is only in 8 sq feet. As many of you know the satisfaction gained and the sheer taste difference in growing heirloom carrots, strawberries, and herbs can be a great way to change perspectives; to have the scales fall from your eyes allowing you to finally see how far we’ve fallen in two generations. I am envisioning a program in our county that would be able to work in partnership with city based sustainability groups, Master Gardeners, and local businesses and nurseries to establish a program to get more people growing more food. To that end I am looking for current groups that are promoting backyard growing in urban areas to get ideas and advice from. So far I like the idea of Future Farmer’s Victory Garden’s 2007+ program -be sure to check out their video to see the community and education possibilities just in the building phase of the project. Their garden is small, but would still provide room for alot of plants with a dense interplanting ala sq ft gardening. 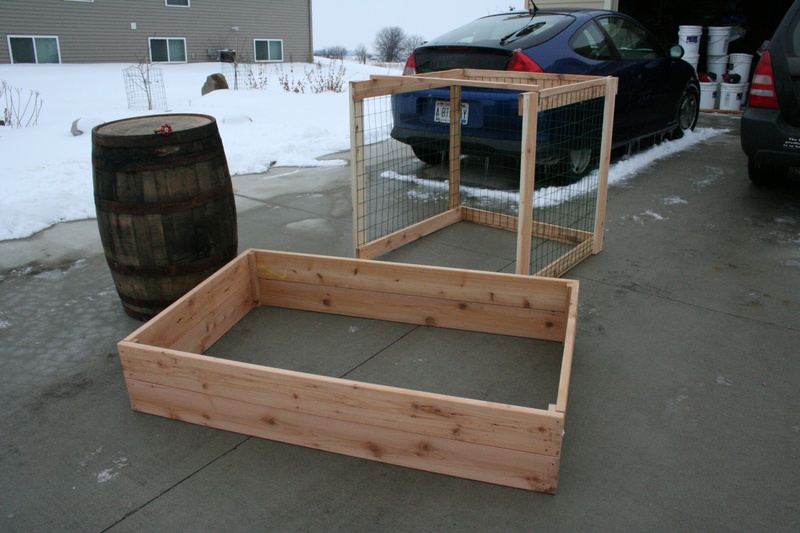 The fact that it is so small actually works in its favor: it allows the use of high grade items like wood sides for the raised bed (I would use cedar here in WI) to promote aesthetics, it could be watered by hand from a rain barrel, and it is not overwhelming. Fertility would be easily maintained by adding compost yearly from small backyard bins. Essentially the garden would be input free using resources on site. See already we have not only grown several dozen salads worth of food, but we are integrating at home water cycling, reducing waste streams through composting, and doubtless the simple acts of growing food will spur thought on how in hell ripe tomatoes are available in Wisconsin year round and why they taste like cardboard. Gardens are a great “in” to teach sustainability! I know that many readers are involved in local gardening programs in their areas of the country. I would love to hear your thoughts as well as any other links to programs that we can learn from.